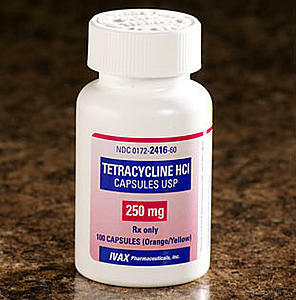 Tetracycline and fluoroquinolones are effective today at killing the plague and they would have defeated the Black Death back at its reign. Sulfadiazine is sometime paired with other antibiotics to fight the virus. A chemical called DDT is used to suppress fleas. Largely populated cities are rat-proofed in order to keep an outbreak from occuring or forming. Hygiene is commonly practiced amongst people. Isolation of the infected keeps outbreaks from forming. An example of how the plague is treated today is with a Colorado case. The young girl from the video was immediately taken into care and examined. Her symptoms: high heart rate, bug bites on thighs (which was a giveaway of what the virus was), low blood pressure, and swollen lymph node in her left groin which was painful enough that it made it difficult to undergo the ultrasound that detected the node. 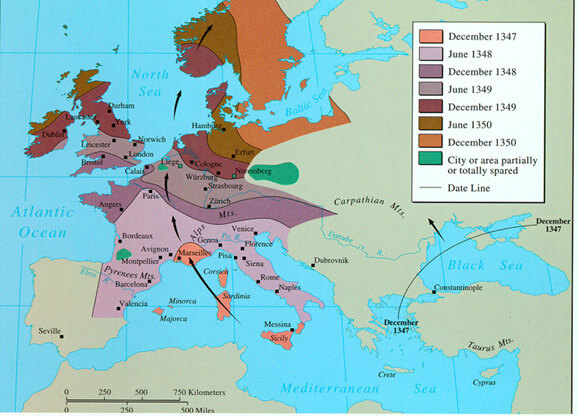 The symptoms identified the bubonic plague. She was medicated and a week later discharged. 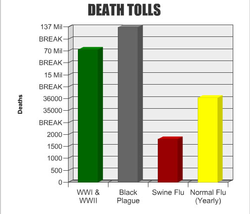 This graph shows the overall death toll caused by the plague, majority of death taking place during the Black Death. Worldwide there are 1000-2000 cases a year.